Today we began the pilgrimage within the pilgrimage. Tomorrow we will travel to Avila to celebrate the Feast of St. Teresa in the town of her birth. We needed to get to Oviedo to take the train to Avila. This provided an opportunity to rest our feet for a bit. This halftime was tentatively planned and much needed. Four out of five of Sonia’s toes were in complete agreement. (Go pinky toe – stay strong). Another gift in this break was the chance to visit Oviedo. We took the narrow gauge from Llanes – a three hour train ride that covered 60 miles. We arrived in Oviedo about noon. It was an opportunity to visit a mid-sized Spanish town complete with narrow winding streets and outdoor cafes. 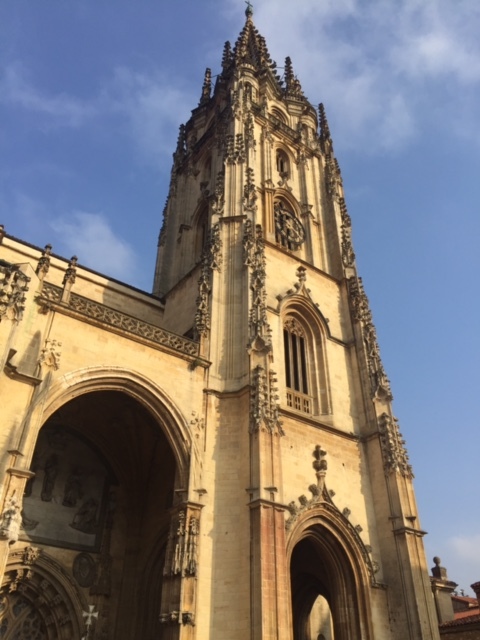 Oviedo is a crossroads for several of the Camino routes and people on the Camino Frances (the most popular routes) could get extra indulgences by detouring here to visit the cathedral. The Cathedral was begun in the 8th century with most of the current construction in the 13th to 16th century. The building is huge and tall with a wonderful plaza in front. Inside the reredos behind the altar is stunning with scenes depicting many moments of Jesus’ life (interspersed with images of the patrons of the work, of course). 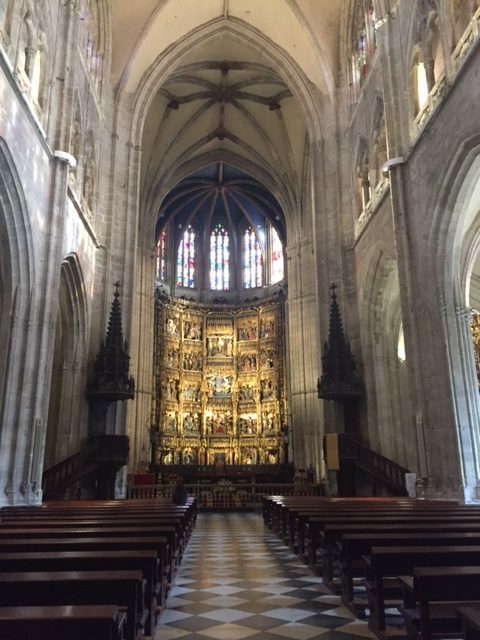 The Cathedral is famous for the many relics it contains including the cloth that wrapped Jesus head at his burial (not to be confused with the shroud of Turin), several thorns from the crown of thorns, and one of Peter’s sandals. 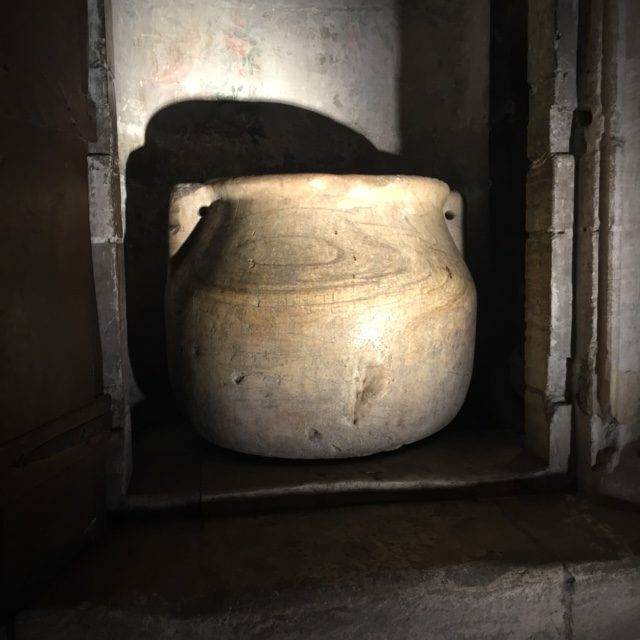 These and other relics were brought in a chest from Jerusalem in the mid first millennia and hidden in the hills of Asturias during the Muslim invasion of the 8th century. From the beginning of the story of Christ we have wanted to get close to what happened and wanted proof. It is said that the number of relics of the true cross, if gathered together in one place, would contain enough lumber to build several Noah sized arks. The holiness of these items and shrines comes more from the centuries of veneration and adoration of the faithful than the items themselves. I am always awed when in the presence of the items. There is connection to the story that we hold dear and inspiration for the life we are called to live as we walk in the path Jesus lid out for us. 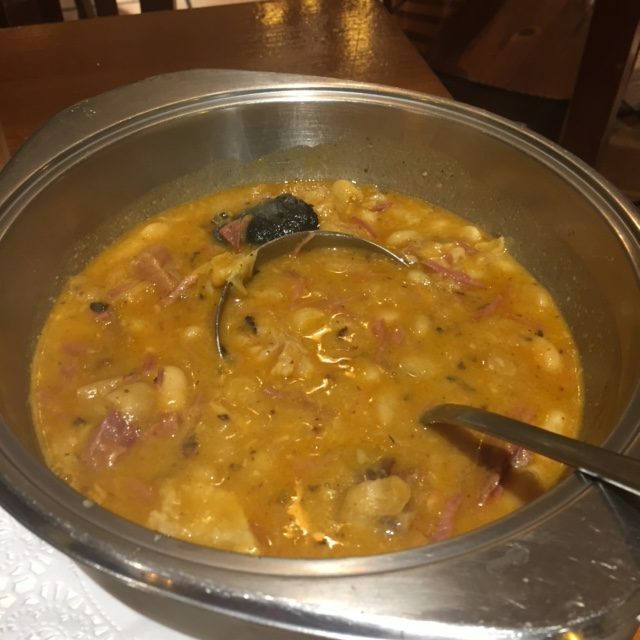 The day in Oviedo ended with Fabada Asturias – the local stew. Bacon, chorizo, blood sausage and white beans. It was a fantastic porridge reminiscent of some meaty split pea soups I have created.